Arthur Bartholomew, 153rd Company, Machine Gun Corps. 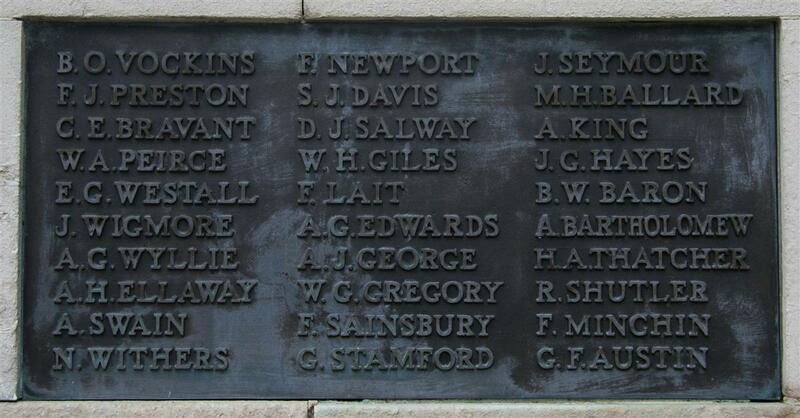 Arthur's name on Newbury memorial (right). When war arrived in 1914, Arthur was working as a carpenter’s labourer. He did not join the initial rush to volunteer, perhaps because he was not yet 18 and hence too young for active service? Inevitably he was conscripted, signing up on 5 June 1916 with the Royal Berkshire Regiment, becoming Private 32928 A Bartholomew. His attestation papers give an idea of his physical appearance: 5ft 6in tall with a fresh complexion, hazel eyes and brown hair. While in training with the 3rd Battalion of the Royal Berks, in late 1916 Arthur heard the news of his mother's death. His next of kin became his eldest sibling and only brother, Frederick Walter. He was transferred to the Machine Gun Corps on 16 February 1917. On 11 April he crossed to France from Folkestone, arriving at the MGC Base Deopt at Camier the following day. On 8 May he was posted to the unit he was to serve with - the 153rd Company, Machine Gun Corps in the 51st (Highland) Division. For the rest of 1917 Arthur would have seen action in a number of major battles, as well as the day-to-day activities during the division’s stints in the front line. At the end of the year he was hospitalised with scabies, which was followed by a month's convalescent leave at home. He rejoined his unit on 14 February 1918. Then in the spring of 1918 the German Army, massively reinforced by the transfer of troops from the Eastern Front, launched a huge offensive. The Allied lines buckled and gave way; in the resultant chaos many units were cut off, thousands were captured - Arthur among them. He was taken prisoner at Monchy between Arras and Cambrai on 21 March 1918. The first news his family back home received would have been the ominous information that he was ‘missing’. All too often this meant that the missing man was dead, but the family would have held out hope that he would turn up in the lists of prisoners received from Germany. The Bartholomews were lucky, they received the news they hoped for - Arthur was alive in German hands. When the guns fell silent on 11 November 1918 they must have been overjoyed at the prospect of seeing Arthur again. Instead they received the shocking news of his death in a PoW hospital at Meschede in North Rhine-Westphalia (about 60km east of Dortmund). Arthur died on 28 November 1918, the cause of his death is not known (effect of wounds, sickness?). Conditions in the PoW camps were not good and many died of disease contracted duing incarceration. He was buried in Niederzwehren Cemetery, Hessen, Germany in grave V.F.7. Locally he is remembered on the Newbury town war memorial and the Speenhamland Shrine (formerly in St Mary's, Speenhamland, but now in St Nicolas', Newbury) .